It doesn’t have Eternal Champions. Many of the fighting games on the SNES are also on the Genesis, and really only a few are only found on Nintendo’s console. Of them, none are equal to the complexity, plot, or all-out brutality that Sega’s brawler brought to gamers everywhere. Developer Deep Water pulled no punches (hah!) and created a game that set out to beat Mortal Kombat at its own game. I think it really would have succeeded too, had Sega not pulled the plug on the franchise just as it was coming into its own. Released in August of 1993, Eternal Champions was considered a killer app that was to go head-to-head with the likes of Street Fighter II. Weighing in at a hefty 24 megs (huge for the system at the time), it featured a fighting system rivaled in depth and intricacy only by the incredible storyline. Nine beings from critical moments in history are saved mere moments from their death and offered the chance to fight for their lives. The winner would face the Eternal Champion and be sent back with the knowledge of how to prevent their demise, thereby fulfilling their destiny and saving humanity. A wide range of participants are available, ranging from the caveman Slash from 699 BC to the cyborg warrior R.A.X Coswell from 2345 AD. Each fighter possessed 35 basic moves and a whopping 17 special moves, making Eternal Champions the deepest fighters ever made at the time. So deep was the gameplay, that most gamers would never master all the moves for a single character, let alone the entire cast. I had done other fighting games and really wanted to build one, but another producer at the time with more seniority than me got that project. He had gotten a Street Fighter 2 machine to study (at the time I was the office champ on it) and when that producer decided to leave, Clyde – the head of production at that time – gave me the project. Against Clyde’s wishes I started the design completely over, which I wasn’t supposed to do, but I kept one thing from the other project, and that was the prototype sketch of Shadow. I always felt that fighting games didn’t have to lack great story and character development, and so the entire story of the three games was always developed from the beginning. I also felt strongly that fighting games should be based on real martial art moves and styles. Latham made good on his intent to bring real fighting styles to the game. All of the characters, save perhaps Slash (and that’s debatable), use a real form of fighting that makes combat more authentic and requires strategy and long-term thinking. Standing in a corner launching fireballs or simply jump kicking your opponent would not work here. Latham went even further, venturing beyond the fatalities found in the Mortal Kombat series. Eternal Champions featured background deaths, or “overkills” in each of the nine stages. This gave the player a great number of methods with which to dispatch his foes, and made the game highly replayable. After a very successful release, a sequel was planned for Sega’s new CD add-on. Latham was again at the helm and used the increased storage capacity of the medium to flesh out the story and gameplay even more. As the only Sega CD game to display all 256 colors on-screen simultaneously, Challenge from the Dark Side showed exactly what the system was capable of in the right hands. It was released in February of 1995 and featured a whopping 25 characters from which to choose (13 at start, 12 hidden). Each had a specific fighting style, background, and story. It bears mentioning that this was long before Capcom made it a habit of hiding large numbers of playable characters. Chalk up another first for Eternal Champions. The plot was described in greater detail, further adding to the original concept by introducing the Dark Champion, who knew of the plan to restore the balance of the universe by saving one of the fighters from death. He has hidden four other warriors, which prevents the tournament from being completed. Now, the warriors had to battle not only each other to save themselves and the universe; they also had to face the Eternal Champion’s dark equal. Wisely choosing to forego the FMV fad that had gripped the Sega CD, Sega Interactive Design used the format in a way that complimented the actual game instead of defining it. A new gruesome finisher, called “cinekills,” was added, rewarding the winner with a short CGI video of his foe’s savage and painful death. Needless to say, the game was a hit. Challenge sold better in the U.S. than the Genesis versions of Street Fighter II. Some players griped about the game’s unforgiving difficulty, but fans loved it. It was everything they had wanted in a sequel and showed naysayers what the Sega CD could do. At the height of the series’ popularity, spin-offs were released for both the Game Gear and the Genesis. Chicago Syndicate, a portable beat-’em-up, featured the 1920s cat-burgler Larson Tyler. With clunky controls, tinny music, and lackluster graphics, it failed to capture the essence of the console games, and was easily forgettable. The Genesis, on the other hand, received X-Perts, a 32 meg action game that starred ninja assassin Shadow Yamoto. Although it featured the concept design of Champions creator Michael Latham and incredible pre-rendered graphics, the gameplay of X-perts turned off many gamers. Control was stiff and unresponsive, and the fighting engine was sub par. Producer and designer Tony Van states that since most of the memory went to the character models, little room was left for animation and variety of enemies. As much as developer Abalone tried, they simply could not match the level of graphics quality and tight control found in Rare’s Donkey Kong Country. The franchise was still going strong during all this time, and several products were licensed for it. Among them were two items created by Sega Toys. The first was a small LCD game (like the Sega games included in recent McDonald’s Happy Meals) and the other was a unique interactive comic book, where you flipped pages and pressed on various screen spots to hear the story. The group of people responsible then left Sega to start a new enterprise based around this Pico-like technology. They called their new company Leapfrog. The third game is all about time travel. The idea was that you could play the side of the Eternals or Infernals and then try and go back to the place of the murder and avoid it. As you won, or locked in a time zone, it would change the present and characters would changes and story lines would change. The idea was for one side to lock out the other to win the game, but instead of being over, it would leave to a battle with Chaos, which was the true evil purposely pitting the two sides against each other to weaken and he wants to total breakdown of the timeline so he can bring on true chaos in all time frames. Skipping the 32X for the Saturn was a wise choice, as Sega Interactive Design was becoming very adept at tapping the potential of Sega’s CD systems. The Saturn was a 2D monster and seemed to have all the bells and whistles to make the final installment of Eternal Champions the best in the series, and possibly the best 2D fighting game ever made. With production just getting started on the final chapter of the Eternal Champions trilogy, Latham was stunned to learn that the project was being cancelled. 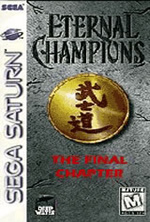 Sega of Japan, in an effort to push its Virtua Fighter franchise in America, decided to can the Saturn Champions game, citing a desire to focus on a single fighting series. I think it has more to do with its coming to the realization that Virtua Fighter was not only an inferior product, but would also not be able to compete with Eternal Champions‘ popularity in the U.S. While Virtua Fighter was very successful in Japan, there was no contest as to which would have sold better stateside. Sega’s eventual decision to farm out the development of Virtua Fighter 3tb on the Dreamcast is proof of this. This was simply another example of Sega of Japan’s arrogance and a failure to understand the American market, an attitude which would eventually force it out of the hardware business. It is a shame that Sega never finished the series. Considering what Latham and Sega Interactive Designs achieved on the much-maligned Sega CD, I can only imagine what they could have done on the Saturn. Their departure from the hardware business instills hope of a revival in the hearts of some fans, but this is highly unlikely. The drawing power of the series, which was once strong enough to warrant a string of merchandise and even talks of a cartoon, has waned the last decade and the original development team has long since disbanded. Latham himself left Sega years ago and without his input and supervision, I would rather the franchise be left alone. It is ironic that Sega would cancel the final game in an immensely popular franchise of its own (which would have been a huge hit had it launched with the Saturn), yet gave seals of approval to such bombs as Criticom, Rise of the Robots, and Zero Divide. You can put this one in the “missed chances” column. Game Info. 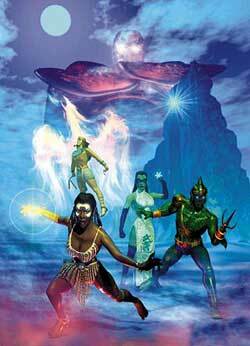 Eternal Champions series. Moby Games. Lachel, Cyril. 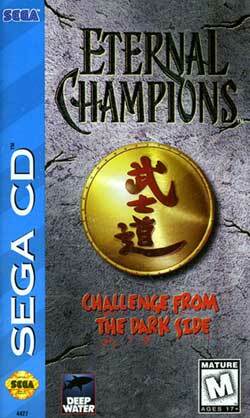 Eternal Champions: Challenge from the Dark Side review. Defunct Games. Pettus, Sam. Eternal Champions: Challenge from the Dark Side review. SegaBase. Steff. Save Eternal Champions! Sega-Saturn.com. Here’s an interesting little tidbit I found. It refers to the Eternal Champion, a character central to the fiction of sci-fi and fantasy author Michael Moorcock, but it also fits the games pretty well! In hearing I must reply. Though it is likely I will die. And what weapon will I carry? Or will companions rightly be wary? For Law and Chaos in this Multiverse. Gods of yet another plane will see. And only Fate knows what will become of me. And I always pay my dues. Witness the Eternal Champions Blues.